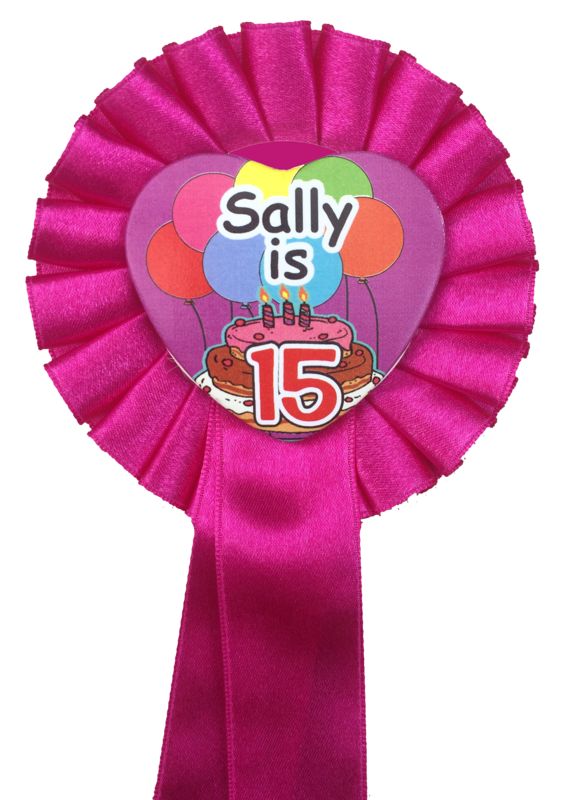 Personalised rosette with a heart shaped centre. Custom designed for you. If you are looking for something a little different when you are buying a personalised rosette, then have a look at our heart shaped centres. We still use the same high quality ribbon to produce the circular rosette shapes. But instead of the usual round centre, we now have the option for a heart shape. The novel shape opens up a new range of design options. We supply the heart shaped centres on rosettes for hen nights. They can also be used, where appropriate on birthday badges. Another occasion for which we supply is for a baby shower party. The centres can be colour co-ordinated to match the colours of the ribbons used. As with our standard range of rosettes, we can provide rosettes with 1,2 or 3 tiers of ribbon. 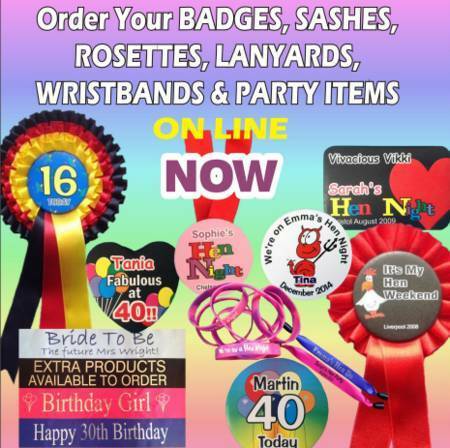 You can choose whichever of the ribbon colours that we have, and have them in whatever colour combination you require. The heart shaped centre fits perfectly in the central area and gives the rosette its unique design characteristics. We have a selection of designs that you can view on the web site pages. If there is a particular design that you like or one of our standard circular designs, then let us know. We can try and accommodate that design into the heart format. Due to the shape of the heart, it is not always possible to incorporate the exact deign. We will however try to produce the heart shape and incorporate as much of the circular design as possible. As the heart shaped centres are actually based on a badge, it is possible to buy the centres on their own, as a badge. If you cannot see the design you want on the web site then just send us an email with your requirements . Describe as much of the design as you can, and will let you have a quotation.